Company: Other small peaceful species. 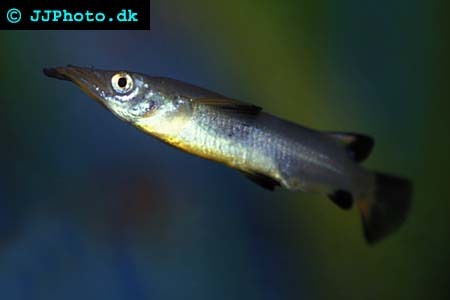 Aquarium setup: Nomorhamphus liemi (Celebes Halfbeak) should be kept in groups and with a gender ratio of about 3 females for every male. The plants should be heavily planted with a lot of floating plants that offers hiding places for females and fry as well as weaker males. The species is sensitive to changes in the water conditions. Feeding: All kinds of small food. Breeding: Males are identified on their stronger colors and their gonopodium. 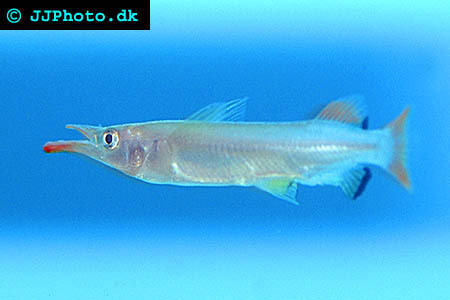 Condition your halfbeaks by feeding them artemia and mosquito larvae. Water conditions should preferable be pH 6.5 and a water temperature 24°C /75° F. The female give birth to a batch of up to 20 fry after 6-8 weeks. They fry are 2.5 cm/ 1 inch at birth.